here’s an old saying: don’t try and teach a pig to sing. It wastes your time and it irritates the pig. 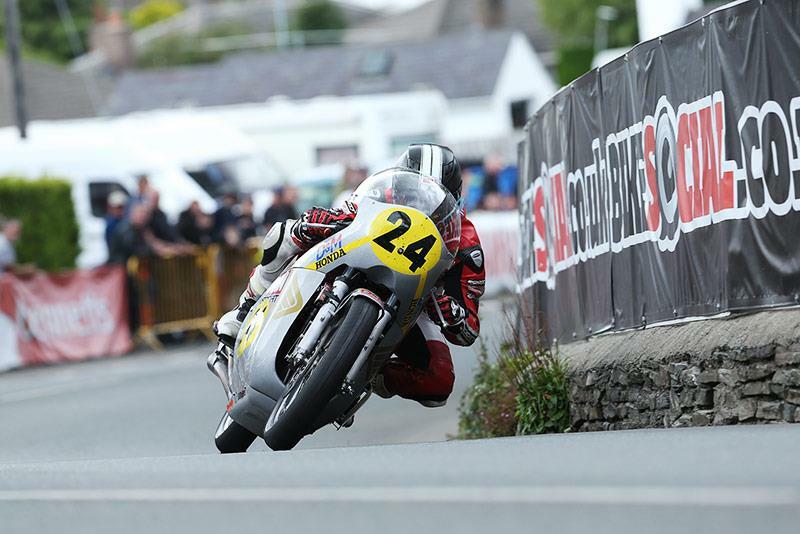 For pig, read any old roadbike that qualifies for the Classic TT’s 500cc race. For singing, read turning said bike into a proper racer. 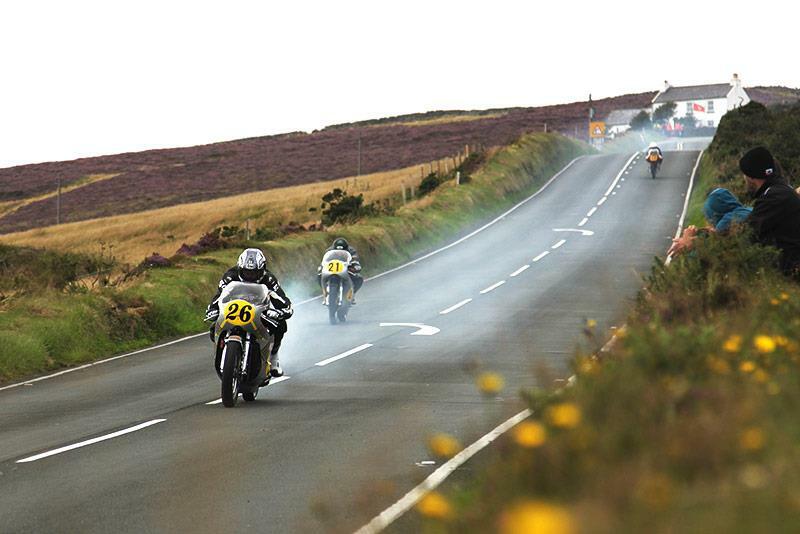 Yes, it’s easy to scoff, but your average Classic TT rider (or bike builder, or mechanic) is a hopeless optimist. Sure, we’d probably love to run the modern replicas of 1960s and ’70s GP bikes used by the top teams: MV triples, Paton twins, Manx and G50 singles. But we can’t, because we are too poor – by many tens of thousands of pounds. So instead we do what we can with the machinery to hand. The need to catch up on his regular business of building classic road and race bikes meant Dave stayed at home, obsessively watching the live times for every practice. Not that there was much, what with rain and a fatal crash at the 13th. By the time I arrived on Thursday morning neither bike had done a proper lap. This was our second crack at the Classic. Last year our one 500 had problems with ground clearance, gear selection, overheating, oil consumption, blowing breathers and stretching cylinder studs. Peter managed the first lap on full song, then the head gasket went, which made the powerband narrower and narrower. When he crossed the line after four laps, ahead of 80-odd other riders, it felt like a win. This year’s bikes are better: slimmer, higher, more powerful, and – as it turns out – completely oil tight. We also have a second rider: the super fast James Cowton, who’s won a Manx and had a third at the North West. In theory we have two engines per bike as well. In reality Pete Carroll raced one at Darley Moor last weekend and did a piston, so the rebuilt version, which we’re saving for the race, has only just arrived. Meanwhile James has to use Dave’s experimental short-stroke motor which should make more power – but doesn’t yet. It’s a beautiful evening, and both riders manage two laps, Peter at 98mph and James at 99. The bikes come back almost as clean as they went out, and barely scraped. Big deal, you say. But if you had been here last year you would know what a titanic achievement this is. One alarming discovery: the spring clip has flicked off Peter’s chain. Dale finds some rivet links. Then Johnny’s phone rings. Peter, back out on the 350, has stopped at the end of Sulby (he always takes a phone in his leathers). The engine had previously slathered the back tyre in oil and been rebuilt. This time the cam’s seized. Johnny and Boasty’s vans are boxed in for the fortnight by Molyneux’s motorhome, so Dave’s mate Ian can go in his van when the roads open. With luck, a lap tomorrow will confirm all is well and we can park them until Saturday’s race. After 30 minutes Dale uproots Peter’s practice engine from its moorings and hefts it to the corner. This awesome display of masculinity is spoiled only by the fact that the engine breather leaks a pint of oil all over his shorts. Johnny drains Pete’s 24-litre tank to find just 8.25 litres left. That’s 21.8mpg – maybe enough for three laps. But it’s not much help when the singles can do the four-lap race non-stop. Over at Sulby, Peter sits shivering on a bench as darkness falls. The marshals have gone home. The moon comes out. A group of night fishermen arrive and offer him a cuppa. He finally gets back to HQ at 10.30pm, cheerful despite being frozen stiff for two hours. He and James discuss gearing and encounters with other riders. William Dunlop’s 500 Honda is a rocketship. So are the four-valve Manxes. “They crack like a motocross bike – rev straight away,” says an amazed James. Next day Boasty’s mate Gary flies in with a suitcase full of spares: two 500 gasket sets, some CB350 rockers, a water pump for the GPZ600 (another practice failure), a new CB500 caliper, and brake pads. Gary’s wife Carol only got to bring one pair of shoes. Dale, Gary, James and his dad Fran fit the freshly-built engine to James’s bike. Firing these things up in the paddock always draws a crowd, because the noise is simply incredible. But this CB, with new carbs and Dave’s highest-ever spec, sounds even crisper. James is unhappy with his Davies Motorsport forks bottoming, so I go round to see John Davies, who also happens to be our nearest competitor, to ask about setup. John gives me the number of Colin, who designed the fork internals. Manx Nortons are revving all over the place and the phone cuts out four times but I eventually learn that we should have 5W oil of a type not available on the island with a 140mm air gap, 2.5-3 turns out of rebound, and 7mm preload. By the time we’ve established this it’s time for scrutineering. The forks will have to remain unmolested. Gary and I push up to scroot, and find ourselves next to Olie Linsdell and his Enfield 500, built by his dad Steve. In 1981 Steve took a ’59 Enfield, which even then was about the most humble and prehistoric motorcycle on earth, to second place in a Manx GP. I so want Olie’s bike to do well. The scrutineer brings me back down to earth: there’s play in the swing arm bushes. “You can do a lap tonight,” he says, but writes a note on the yellow ticket, which means we have to fix it. I ring Dave. He’s just put the phone down to Boasty, who has ordered yet another pile of spares. They’re coming over with a friend of Dave’s who’ll arrive at 6am tomorrow. For practice I nip to the Creg and walk up to Kate’s Cottage. On the wind I can hear the bikes roaring through Crosby, 30 racing miles away. Peter’s bought an £1800, six-speed gearbox for his race engine and it pays off: 101mph places him 15th fastest. The top three are McGuinness, Farquhar and Lougher on Patons, then Dean Harrison on the MV triple, Rutter on a Seeley and Dan Cooper and Danny Webb on Molnar Manxes. But James doesn’t show. He’s stopped at Ballagarey with a slipping clutch. Gary and Johnny report that he gave it a handful off the line. The bike’s covered in oil too. Back at the tent James is in a dark mood. The big step forward with the latest engine has not materialised. Checking the bike shows why: the left inlet valve inspection cap is smashed out. Peering inside we discover an adjuster locknut has got loose, whereabouts unknown. In the process it’s dinged the collets and retainer. “I’m not stripping heads and changing valves,” says Dale, who’s worked to at least 10pm for the past week. We’ve got Peter’s practice engine, but no carbs to go with it. Our only option is to swap back to the short-stroke motor that ran OK last night. Dale looks weary, but perks up when a passer-by gives him a can of lager. 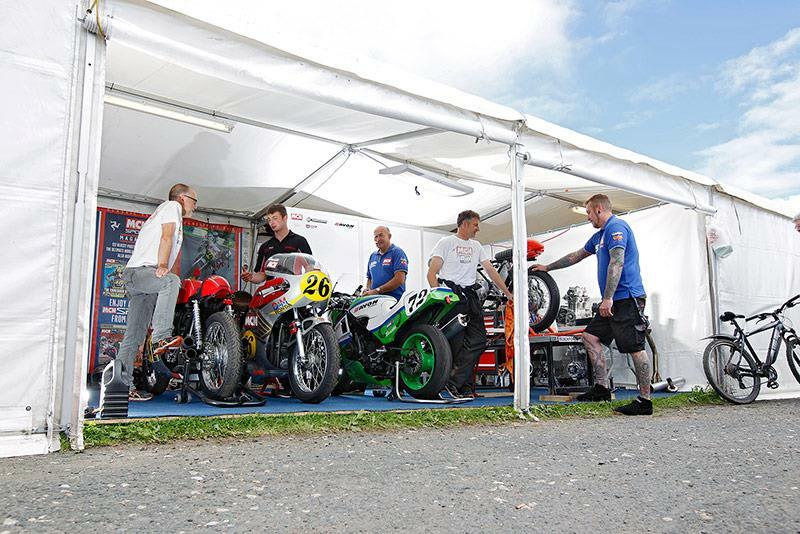 To spanner at the Classic TT is to enter a world where every problem solved leads to a new problem. A world where you forget to eat, are too tired to wash, where you can’t even spare the time for a wee. I make my excuses and leave. Gary stays with Dale to help him. James nips down to his caravan for a spot of grub before coming back with dad Fran to join in. For the race, I go back to the Creg. It turns out to be the right place. Not only are the leaders sensational to watch all the way down the hill and past the pub; Boasty and James appear at Kate’s side by side. They’re still together as they brake and tip in. Boasty makes the pass, as James’s bike belches ominous amounts of smoke. The radio reports shocking rates of attrition. Maria Costello, William Dunlop, Ryan Farquhar and John McGuinness are all out. James stops at the pits, but Boasty is up to tenth. Except that next time he appears he’s trailing a blanket of white smoke. The crowd gasps, and the marshals black-flag him in at the Creg. Later still we bump into the guy who was right behind Peter when his engine woofed: Norton rider Wattie Brown. He has a large Guinness on the go after finishing first in the privateer singles class despite a 30-second penalty (his crew used a video camera in pit lane), gear selection problems – and peering through a mist of oil. Engine: short-stroke crank (bore x stroke 60 x 44mm), big valves, race cams, high comp pistons, APE studs, ported head, modified Swarbrick CB350 kit pipes, five speed gearbox, PVL self-gen ignition, 29mm CR Mikuni carbs. Oil is Silkolene Pro 4 10W60 full synth. Chassis: narrowed and straightened subframe, Davies Motorsport forks, stock yokes, twin 300mm discs with Lockheed calipers, Falcon 365mm shocks. Glass fibre race fairing, tank and seat. Engine: stock crank (bore x stroke 56 x 50.6mm), big valves, race cams, high comp pistons, APE studs, ported head, 4-4 megas, six speed Nova gearbox, PVL self-gen ignition, 26mm CR Mikuni carbs. Oil is Silkolene Pro 4 10W60 full synth. Chassis: stock de-lugged frame, Maxton forks, stock yokes, single 300mm disc, Lockheed caliper, Falcon 365mm shocks. Glass fibre race fairing, tank and seat.